The Historical Jesus reveals the true Jesus–who he was, what he did, what he said. It opens with “The Gospel of Jesus,” Crossan’s studied determination of Jesus’ actual words and actions stripped of any subsequent additions and placed in a capsule account of his life story. 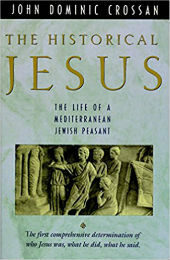 The Jesus who emerges is a savvy and courageous Jewish Mediterranean peasant, a radical social revolutionary, with a rhapsodic vision of economic, political, and religious egalitarianism and a social program for creating it. With this groundbreaking work, John Dominic Crossan emphatically sweeps these notions aside. He demonstrates that Jesus is actually one of the best documented figures in ancient history; the challenge is the complexity of the sources. The vivid portrayal of Jesus that emerges from Crossan’s unique methodology combines the complementary disciplines of social anthropology, Greco–Roman history, and the literary analysis of specific pronouncements, anecdotes, confessions, and interpretations involving Jesus. All three levels cooperate equally and fully in an effective synthesis that provides the most definitive presentation of the historical Jesus yet attained.